Shipping a large package is not the same as shipping a standard package. You should pay particular attention to the packaging method and packing materials you are going to use. This is especially true if you are going to ship fine art or any other fragile and delicate item over a long distance. 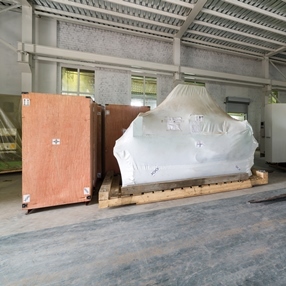 Moreover, if you are shipping a sculpture, a large painting, or a valuable piece of antique furniture, be sure to choose a reliable artwork shipping company specializing in the safe and secure transportation of oversized items. Fine Art Shippers has more than two decades of experience packing and shipping art and antiques of any size and weight. These include glass and metal sculptures, huge paintings, natural wood furniture, and even vintage grand pianos weighing half a ton each. We can also transport heavy equipment and vehicles if necessary. This simply means that shipping a large package over a long distance is not a problem for our experienced team of art shippers, and we are always ready to solve even the most challenging shipping problem. However, if, for any reason, you decide to pack your large item yourself, make use of the following packing and shipping tips we have prepared for you! Opt for only high-quality materials and supplies made for packing and shipping large and heavy items so that they could withstand a long-distance move and arrive at the destination intact. Consider custom wooden crates as they provide the best protection to the transported items and prevent them from being damaged due to improper handling. Carefully label the box with appropriate shipping labels and don’t forget to list the full address of both the receiver and sender. Tape over the label to prevent it from being obliterated. Insure your package for its full value prior to shipping. It won’t break your wallet, and you will get peace of mind knowing that your package is completely protected in transit. Take your time to choose the right company for shipping a large package over a long distance. You can also request free shipping quotes from different companies in order to select the one that suits your budget best. At Fine Art Shippers, we would be happy to provide you with any local, national, or international shipping services you need! Just give us a call, and we will take care of everything else!